If you are seeking to have a slender and healthy body, you must educate yourself on the full side effects of consuming the wrong kinds of food. And by education, we don’t mean the kind of information you would often find in diet books, magazines and on popular TV shows. Many of these “revolutionary diets” are super complicated and very restrictive making your life a miserable mess. During the years of our own studies on how the body functions and experiments with nutrition and healthy lifestyle, we have found over and over again that the whole food plant-based approach is the best. Fad diets, crazy food restrictions, celebrity endorsed plans with the promise of fast weight loss or great physical health are complicated – on the other hand, Nature’s way is SIMPLE. If you are carrying excess fat around your body, you are undeniably carrying a heavy load not only physically but also mentally and spiritually. You might feel restricted, sluggish and possibly even unhappy with your life. If you have already been on several weight-loss programs, only to fail after carefully reading and following every part of the plan, we can only encourage you to learn from your past mistakes, so you will not repeat them in the future. Once you understand and experience the power of eating whole, unprocessed plant-based foods that Nature provides us with so we can look, feel and perform at our very best you will never want to go back to eating unnatural, dead and harmful foods ever again! 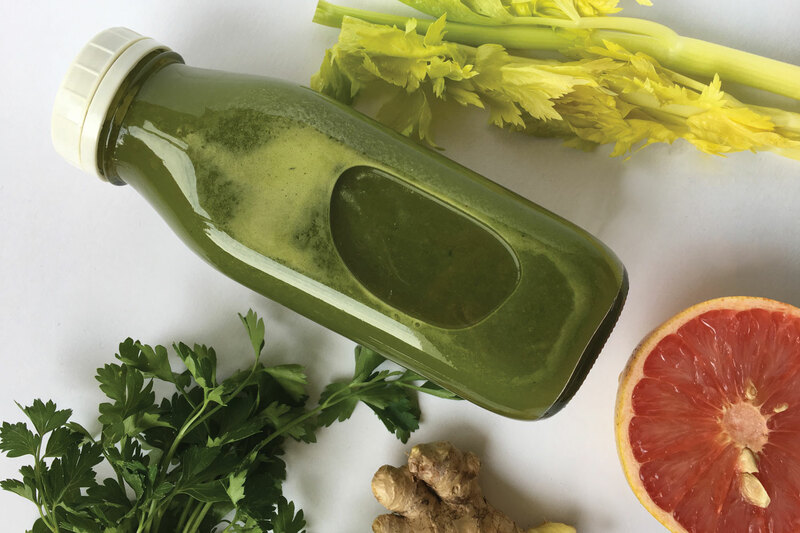 Today we want to share with you a tasty green juice recipe that helps rid the body of the excess “junk” that has collected over the years (this is a big contributor to weight gain). 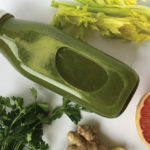 This juice, along with lots of water, will help flush out toxins, reduce bloating from processed foods and remove the “fog” that alcohol, caffeine and artificial sweeteners often leave behind. Be smart. Today is the day to start. Do not postpone your health and happiness for one more second. Start educating yourself and nourishing your body with clean living foods. This is your life and health is your true wealth. Invest in yourself. Celery – detoxify the organs, brighten the skin and calm chronic inflammation. Parsley – very low in calories but contains many essential nutrients, such as vitamins A, B, C and K and minerals iron and potassium. It is rich in chlorophyll, which improves detoxification and supports weight loss. Also helps to reduce water retention and bloating. Pineapple – one of nature’s most powerful anti-inflammatory foods, aids in repairing tissue, healing wounds, and promotes healthy cell growth. Grapefruit – a powerhouse when it comes to burning fat as well as a tasty way to instantly boost your energy levels. Ginger – helps remove harmful bacteria from your gut that might compromise your immune system. Promotes weight loss by activating the metabolization (burning) of stored body fat. Wash all your produce well. Peel the pineapple and chop it into small pieces. Cut the tops and bottoms of the grapefruits. Then get a sharp knife and cut around the edges to peel off the skin. Do your best not to cut the white pith away – as it contains a ton of nutrients. Feed the ingredients into the juicer starting with celery, then parsley, then grapefruit, ginger and then pineapple. Prep all your produce - wash, peel and cut. Place all ingredients in a blender and blend until smooth, adding about 1/4 cup of filtered water. Place a fine mesh strainer over a large bowl and pour the juice over. Use a wooden spoon or spatula to press the pulp down and squeeze all of the juice out. Allow to sit for 2-3 minutes to let most of the juice drain. Discard pulp and pour your juice into a serving glass. Drink immediately. Looking for more weight loss promoting recipes? 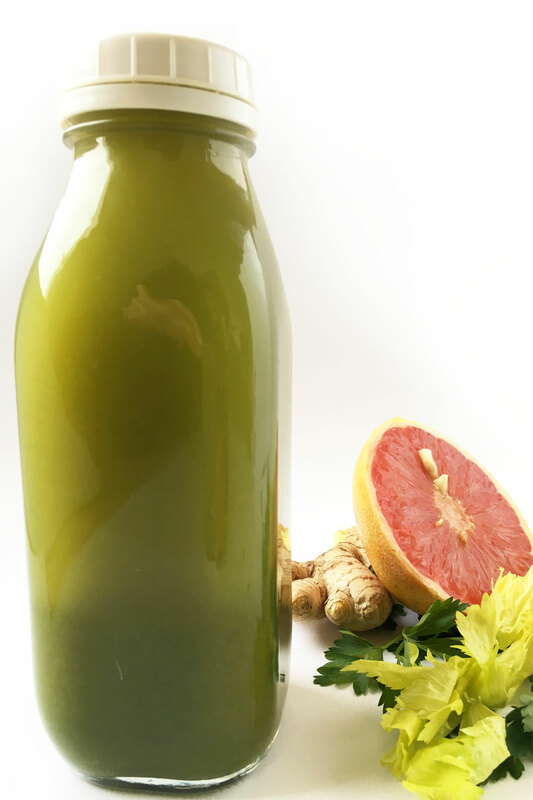 You might want to try the Juice for Weight-Loss, Energy and Detox, Vegan Borscht, Raw Vegan Pad Thai and the Lettuce Tacos filled with Quinoa Apple Salad.